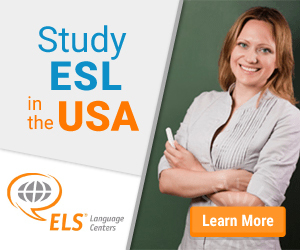 If you are an international student and are interested in improving your English, there is no better place to study English as a Second Language (ESL) than the United States. Whether you want to learn English for work, school, business, or medicine, you are bound to find a program in the US to suit your needs. The world is becoming more and more interconnected every day. As it becomes possible to communicate with anyone in the world in real time, there is really only one remaining obstacle: language. There are over 6,500 languages spoken around the world. The second most common of these languages, after Mandarin, is English. English is considered to be one of the most important languages to learn for a variety of reasons. Most international business in conducted in English, so if you are looking to be employed by an international company, you will likely need to meet minimum English requirements in order to advance your career. Or, if you are interested in studying abroad in an English-speaking country, most schools will require that you have a minimum understanding and proficiency in English. Even in non-English speaking countries, you will often find that most people’s second language is English. Pathway Programs give students the opportunity to study English at a US university when they do not yet meet the language requirements for the degree program of their choice. In preparation for both undergraduate and graduate programs, Pathway Programs allow students to study English, while developing academic skills and learning about student life in the US first hand. At the same time they acquire credits towards their Bachelor’s or Master’s degree. Oftentimes, students can directly enter into the second year of an academic program. There are some pathway programs that provide exceptional support to international students to ensure that their transition into the US is a smooth as possible. These Pathway Programs work with recruitment counselors at major US universities and colleges to guide students from the application process until their arrival on-campus. This is especially helpful for international student who find parts of the enrollment process difficult, such as applying for a student visa, finding health insurance and making travel arrangements. These pathway programs will guide their international applicants every step of the way from finding a meal-plan, housing options to picking them up at the airport. There are many colleges and universities that provide this hands-on approach for students enrolling in their Pathway Program. Here are just a few schools that offer Pathway Programs you should consider! Auburn University located in Alabama, is one university that provides amazing support and counseling to their incoming international students. While learning English as a student on their campus, international students can also participate in their academic classes and receive credit in some of the US top programs for Engineering, Business and Agriculture. For students that are searching for a school with emphasis on religion, the University of Dayton is a private Roman Catholic school that provides support for their Pathway students. For students that are really interested in the American experience, why not study in the heart of the US in Washington DC at American University. At American University, you’ll be surrounded by American culture and history while learning English, and have an amazing experience. For those student who are interested in internship opportunities while learning English in the US, Adelphi University is located forty minutes outside of New York City, the hub of international business. Students that enroll in Adelphi’s Pathway Program have opportunities to intern at companies like Verizon, PepsiCo and more. English is also one of the main languages of entertainment. Learning English can help you better appreciate music, movies, and books. Additionally, the vast majority of all papers published in scientific journals are written in English, and there are over a billion pages of websites in English. The ways in which learning English can benefit you are endless. If you are looking to advance your career, learning English is a great step. Learning English can improve your chances of getting a job, as well as your chances of career advancement if you are already employed. Being able to write your resume/curriculum vitae and cover letter in English will open you up to possible opportunities with companies that require your applicant information to be written in English. A well-written resume will show a potential employer that you have a good command of English, and encourage him or her to invite you in for an interview. In your interview, your English fluency will also help you to secure the job. The world is becoming more and more connected, and the need for communication has never been greater. The majority of international business is conducted in English, so even if your interview is conducted in your native language, having the language experience will be invaluable. The same applies to advancing your career after you are hired; knowing English can help you establish relationships with people who can help you with future promotions throughout your career. Schools such as the ELS Language Centers are designed to help you improve your professional English communication skills so that you are able to advance your career. With a number of Business English program, students are able to build on their English core so that they become more comfortable in a business setting. These programs give students the ability to improve their English learning through lectures which are then enhanced with a required internship so that students can get real life experience. If you are interested in studying internationally in an English-speaking country, you will most likely be required to meet a minimum level of proficiency in the English language. And because it is spoken so widely across the world, speaking English can help you communicate even in non-English-speaking countries. Some of the best colleges and universities in the world are located in English-speaking countries such as the US and the UK. These colleges and universities use English as their medium of exchange. Learning English can help you to obtain a world-class education that will benefit you for the rest of your life. ELS Language Centers provides academic and intensive English programs to help you ace the entrance exams and feel comfortable while learning at one of these institutions. There are programs out there to help you improve your English for your academic career, focusing on listening, reading, writing and speaking. Many of these programs can also prepare you for the TOEFL exam so that you'll be ready. Other programs take it one step further and help you achieve your academic goals while you learn English. There are many types of English programs out there, so be sure to do the research to find the one that best aligns with your academic needs. If you are a medical professional, you know that patients come from all over the world and speak a number of languages. Today, more and more people speak English, either as a first or second language, and so it is becoming more and more necessary for medical professionals to learn English. With English skills, you will be able to communicate with more of your patients and their loved ones, as well as fellow medical professionals who speak English. Medical English courses are unlike normal intensive English programs. You should already have mastered general (conversational) English before enrollment, as these courses are designed to teach English used in a hospital or clinical setting. Your conversational English should be at an intermediate or advanced level, and you should have a thorough understanding of anatomy, physiology, and your own medical concentration. So whatever your reasons for learning English, it is bound to benefit you for the rest of your life. Have a Question about ESL Schools? Ask our Student Advisor your English as a Second Language question! Visit the Study in the USA School search to find schools that offer programs of study in English as a Second Language. Over time we will be updating this section and including more information for those who want to study english as a second language in the USA and for other countries, but please feel free to post your thoughts and comments on our Facebook fan page, and also follow us and post questions through Twitter.